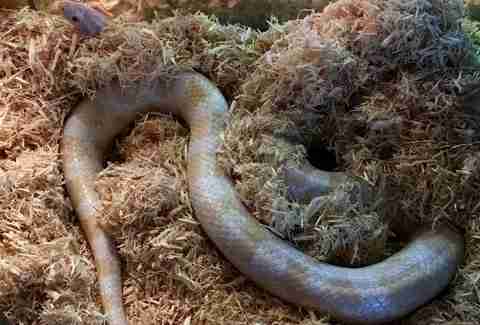 It’s a natural instinct for many snakes to hide under rocks or logs in the wild. 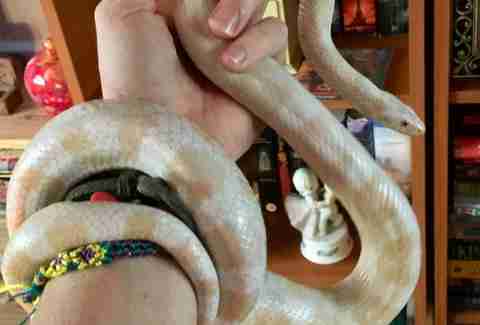 But one snake named Sammie has a rather unusual place that makes her feel safe and secure — a place where snakes are not usually allowed. 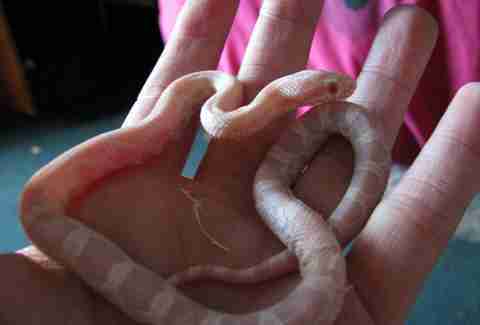 Vivien Leanne, a pianist and music teacher in Suffolk, England, had no plans to adopt a snake when she met Sammie. 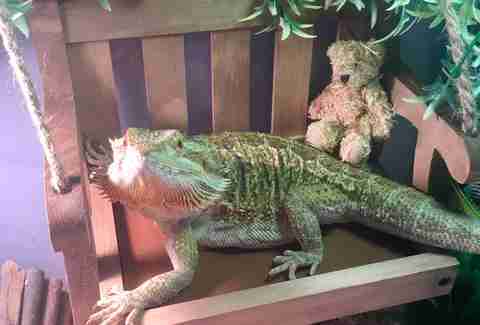 With a bearded dragon named Kit and two ancient tortoises already at home, another reptile was the last thing on her mind. Out on a lunch break one day, Leanne was taking a walk down some unfamiliar streets when she came across a pet shop in trouble. 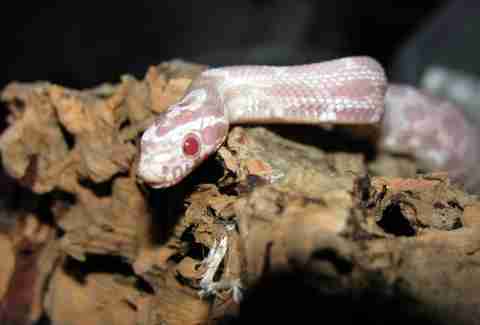 With most of the tanks empty, one tiny albino corn snake, with red eyes and pink scales, caught Leanne’s eye. Sammie has always liked to find secure, comfortable hiding places, though some are more convenient for Leanne than others. Sammie is able to completely disappear into her mom’s long, thick hair, and so good is that hiding place that she will even, on occasion, join her mom for work. “I’ve taught whole piano lessons with the student unaware that there’s a little scaly friend lurking on my shoulder,” Leanne added. While her mom’s hair will always be her favorite hiding place, Sammie has found somewhere else to shield her from the bright sun and it’s a bit more convenient for all parties involved: a birdhouse. 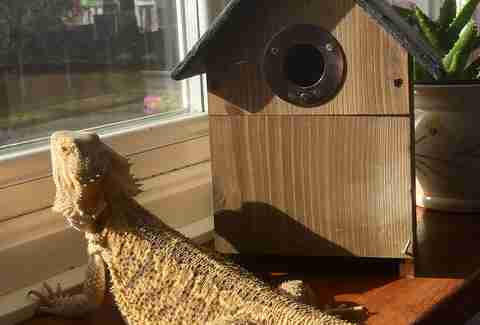 “Originally the birdhouse was for my bearded dragon Kit. 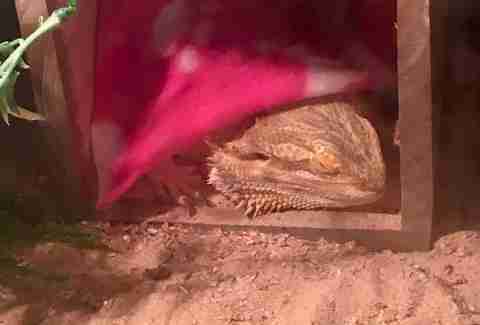 He’s just grown old enough to have his first ever brumation [winter hibernation] and he was a bit unsure how to make himself hide. 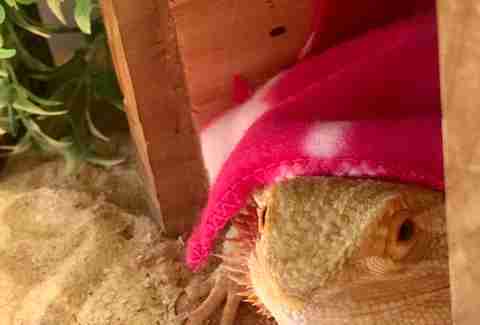 He kept getting wedged against the tank or burying himself under his water dish and getting soggy and annoyed, and a grumpy sleepy lizard isn’t the best company,” Leanne said. 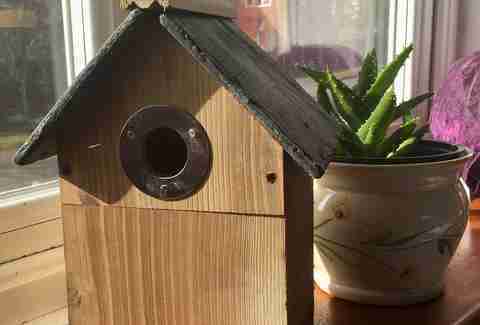 When Leanne saw the birdhouse while out shopping, inspiration struck. When Kit woke up from his hibernation full of energy and ready to play, Leanne decided to see if Sammie would like a turn. Leanne is not entirely sure what it is about the bird feeder that makes it a household favorite. These days, Sammie loves burrowing under the birdhouse, hiding herself completely for some alone time. 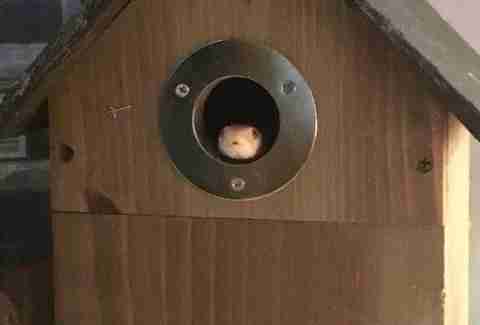 “Sam has always had wooden hides like hollowed-out tree branches, but I think she prefers the fact that the birdhouse is designed to be sheltering and she can hide completely if she wants to,” Leanne said. This has caused some jealousy between the reptile brother and sister.